Seriously Microsoft. What sort of passive-aggressive, self-destructive move propelled you to release the long-awaited Microsoft Word iPad App which came encumbered with the addition of a $99.00 a year subscription? To expect consumers to pay $99.00/year to use this App when Apple’s iPages App is absolutely free is absolutely mind-boggling. Additionally, Apple’s iPages allows one to edit documents and then email them in a Microsoft Word format if one desires. No wonder your stores are empty and Apple’s are filled to the brim. I mean – the $99 price take was hefty enough for an iOS app – but on a yearly basis? Are you kidding me? Apparently, this new App is dominating the App Store with exceptional download activity, but has anyone determined how many people, upon learning that they have to pay an exorbitant yearly fee for this App, have also deleted the App? I would love to see those numbers. And, truth be told, I am so accustomed to using iPages that I have no compulsion to change teams. Because iPages just works – and it, along with the entire iWork suite, is free with new purchases. What do you think everyone? 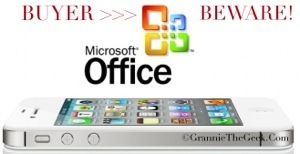 Did you fork over $99.00/yearly for Microsoft Word’s iOS App? Do you prefer iPages? Share in the comments. Happy Everyone? Apple just confirmed that Lion will be released tomorrow. I guess the Lion won’t sleep tonight after all. Neither will any of us!